Mark Lieberman spent years tracking down an elusive Tucker. Mark has forwarded several 2016 photos of Tucker 1044 on the day that he was able to purchase this "barn-find". Steve Lehto reported on Mark's Tucker journey in this July 25, 2016 posted on Road & Track's website. Photos of courtesy of Mark Lieberman. Just when you think every barn find has been uncovered, another one pops up. Preston Tucker's car company was responsible for 51 cars being built. Of those, we know that 47 "Tucker '48s" have survived and we know where all of them are. Sometimes, they come up for sale and fetch millions. 15 years ago, Mark Lieberman located one in a barn in Ohio. Tucker #1044 had not been driven since about 1982 and it became Mark's goal to acquire the car and restore it. 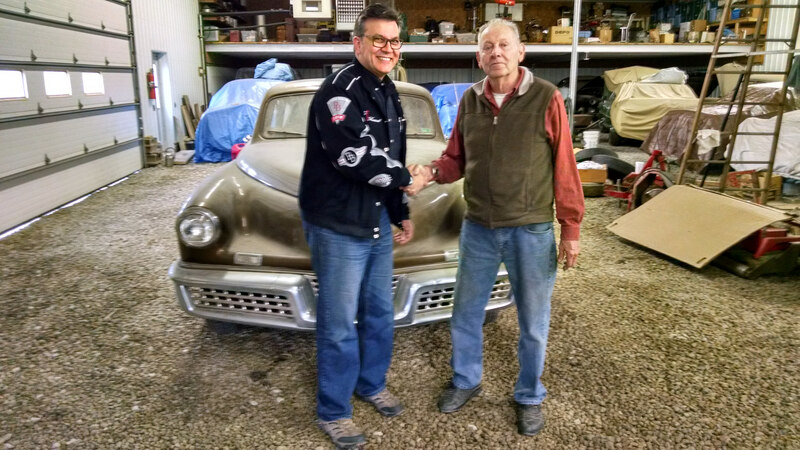 Mark Lieberman owns Nostalgic Motoring, where he buys and sells collector cars and also helps restore them. 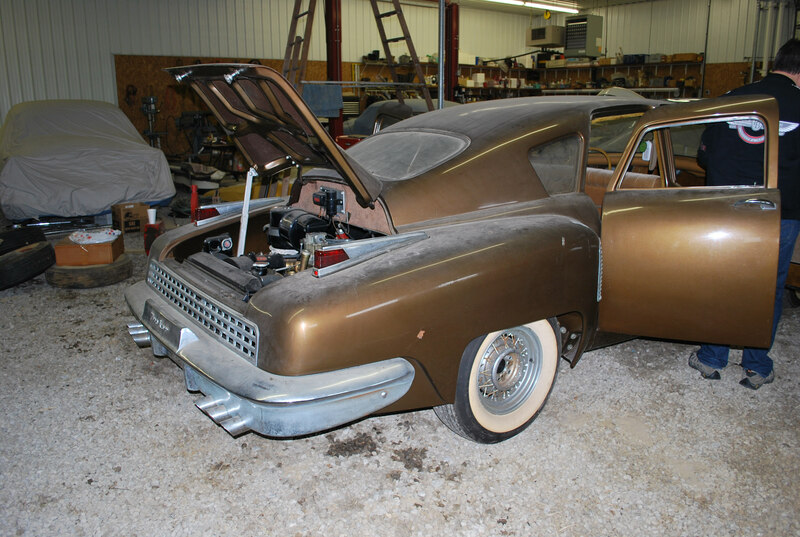 In his career, he has owned three Tuckers – and if he bought this one, it would be his fourth. He has also helped restore a few for clients. In 2013, one of those restored Tuckers, #1043, set the record for a Tucker sale at $2.915 million. So, when he set out to restore #1046, he wanted to look at another late production Tucker to study how the radio bezel looked. Radios were optional on Tuckers so to find one as a reference meant finding a Tucker so-equipped. Mark knew that #1044 was in Ohio and that it had a radio in it. Mark tracked down the owner and soon had an invitation to come see the car. Tucker #1044 was, in essence, in a barn. It was stored in a metal building with a gravel floor but the owner had laid down a makeshift wooden floor of 2 by 6 lumber to help protect the car from moisture in the ground and the building was weather tight as well. Mark walked around the car and was impressed with its condition. The owner had gotten the car in 1982 and only driven it three times – for a total of 15 miles. In fact, when Mark first saw it, the odometer read 7,877 which all parties believe to be accurate. The owner of the car had a few issues with it and had parked it hoping to find the time later to iron out the bugs. 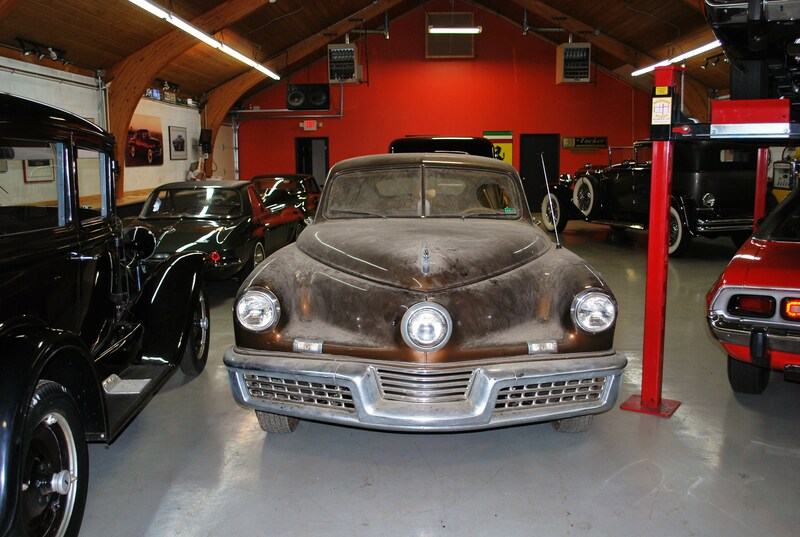 The problems were of the sort many Tucker owners are familiar with: transmission issues, cooling problems and so on. But, as they say, it "Ran when parked." After looking it over, Mark told the owner he would love to buy the car. The owner had no interest in selling but Mark stayed in touch after he left that day. Three years later and following numerous conversations, the owner agreed to sell the car to Mark. A deal was struck and Mark headed to Ohio. He brought his trailer. They winched the car into the trailer and Mark brought it back to his shop in Auburn Hills. There, he went through the car thoroughly. Brakes, fuel lines, radiator, fuel pump, carburetor, ignition. Everything was remarkably serviceable considering how long it had been since the car had been driven. 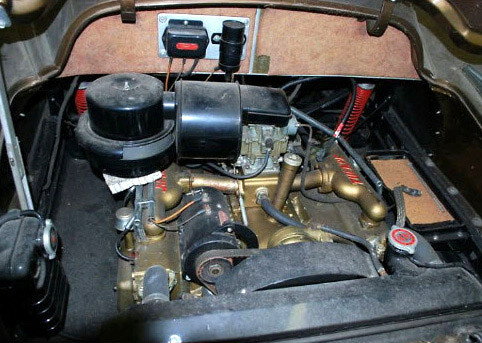 Mark went through the steps one takes when reviving an engine that hasn't been turned over in 30 years and then – it started right up. The car now runs and drives. The car you see in the pictures is a lovely shade of root beer brown. It had been repainted a few owners back – maybe in the 1970s – but it came from the factory in Andante Green. Mark plans on getting the car back to that color along with a complete top to bottom restoration, of the sort he has done on previous Tuckers. The good news is that #1044 has remained in very good condition over the decades. The doors are tight and the body and frame show virtually nothing in the way of corrosion. 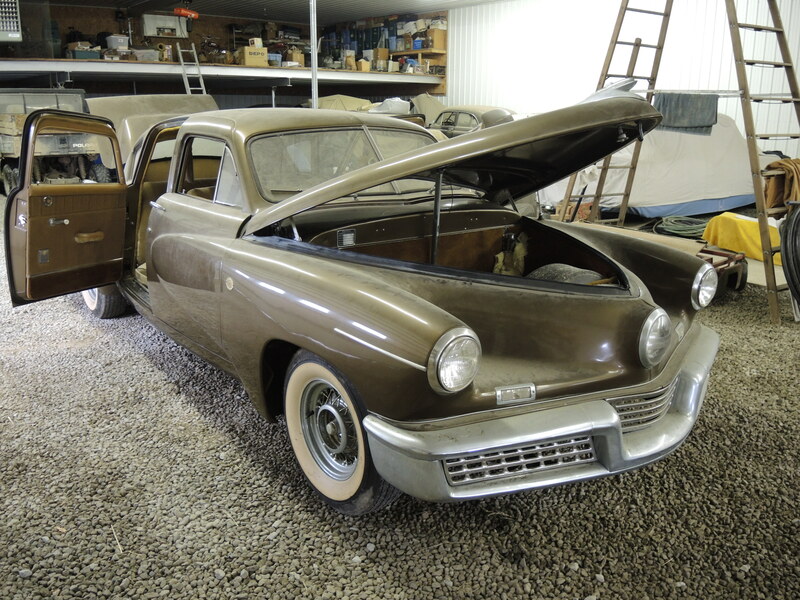 As the "Before" car in a restoration project, this Tucker is in better shape than any Mark has restored before. And remember, one of those cars sold for almost $3 million. This restoration very well could take a few years so Mark has decided to leave the car as it is for this summer and will spend a bit of time enjoying it before it gets laid up for all of its work. He says he'll pop in unannounced at a few car shows or even the occasional Cars & Coffee. 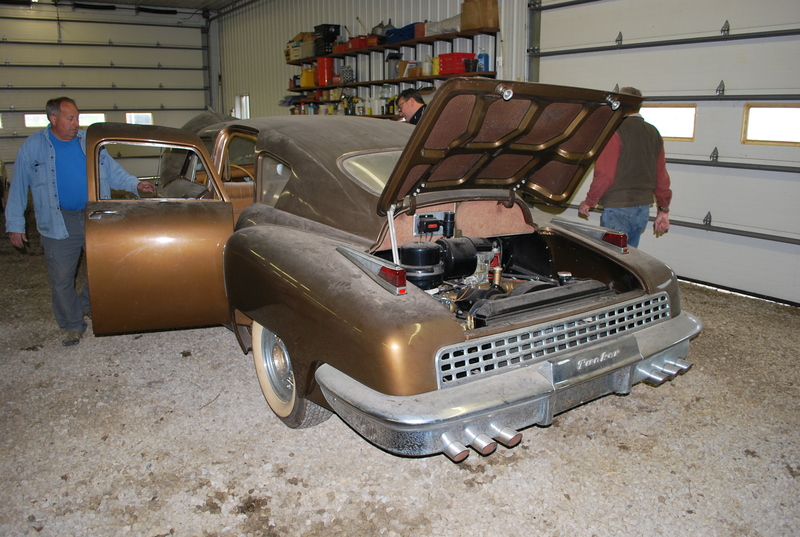 After all, when was the last time you saw a Tucker '48 show up at one of those? Magnificent car , and a kings ransom!!! Would love to see a real car up close and personal !